How to Get the Most Out of Your Elliptical Trainer Workout. Research has shown that workout sessions with higher intensity are more effective at jump starting your metabolism and burning more fat throughout the day. Exercise can help you manage your stress levels, slow aging symptoms, and even help you manage ADHD symptoms. Ellipticals are wonderful machines with many benefits help you get in a workout that is easy on your joints while providing muscle toning and a cardio workout. Use these tips to make sure that you are making the most of your next elliptical workout. Push yourself! Long and slow workouts are not very effective at burning fat or providing long lasting results. Pay attention to your strides per minute (SPM) and keep the number between 140 and 160. If you’re doing sprints, then make sure you’re going over 160 SPM. Pay attention to your feet. Using different muscles will help target and tone different muscle groups in your legs. For example, pressing with your heals will target your hamstrings and glutes. Pressing with your toes will work your quads more. Pedal backwards sometimes. Pedaling backwards is a great way to work your hamstring and glutes. Increase the intensity by squatting down a bit while pedaling to really make your muscles burn! Work your arms and your legs equally. 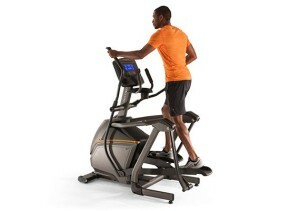 Ellipticals have a major advantage over treadmills in that they allow you to work your upper body. Don’t just mindlessly hold on to the handlebars while you move. Actually try to push with your arms to tone your upper body. Some machines from Yowza Fitness have the Cardio Core feature that intensifies the upper body workout even more. Try going hands free. If you let go of the handlebars completely, you will be challenging your balance and working more of your core muscles. Try putting your hands on your hips during this motion. Keep things interesting! The worst thing you can do is to slog through the same workout at the same pace every single day. Instead, vary the incline, switch up the resistance levels, and alter your body position from time-to-time. Try doing sprint intervals or extreme inclines to jump-start your body’s fat burning process. 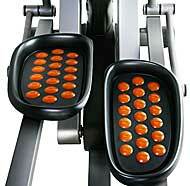 Check out our Buyer’s Guide to learn more about what to look for in a great elliptical. Plus, check out our Best Buy Ellipticals list for some great machines – including low priced options under $1000. What other tips do you have to make the most of your elliptical workout? Comment below!